and this isn't the first time he's killed. And when Gina's brother comes after her, Shane is assigned to protect her and uncover the truth. Suddenly, Shane-a cop who always hoped to join a big-city force-vows to stay by Gina's side as a murderer lurks in the small-town shadows. Rookie K-9 Unit: These lawmen solve the toughest cases with the help of their brave canine partners. This is the beginning of a new series and I know I am going to like it! The basic storyline is about rookie K-9 officers and the lead dog trainer who is murdered. Because there have been other suspicious deaths in the previous 2 years, the police think they might have a serial killer on their hands. This first book sets up all of this. Terri does a great job of starting the series and there is non-stop action right from the get-go! Gina is attacked by her twin brother and that ultimately leads to the discovery of the murdered dog trainer. The mayhem continues through the book only the law enforcement officers don't know if it's Gina's brother or someone else. Are there more suspects involved or what? Shane West is the rookie K-9 officer who is assigned to watch Gina and keep her safe. Gina is one of the dog trainers too but she's not an officer. As Gina, Shane and the rest of the rookie officers try to figure out what's going on, a LOT of suspense I happening! I could hardly put the book down! I really wanted to see how the book ended! I also liked the relationship that developed between Shane and Gina. I can't wait to read the rest of the series! You wont be sorry you picked up Terri's book! 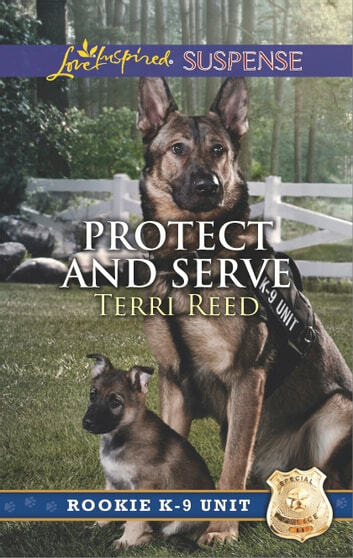 Title: Protect and Serve Rookie K-9 Unit Book 1 Author: Terri Reed Publisher: Love Inspired Suspense Published: 4-5-2016 Pages: 220 Genre: Mystery, Thrillers & Suspense Sub-Genre: Contemporary Romance; Police Procedurals; Inspirational ISBN: 9780373447336 ASIN: B015W85I2E Reviewed For NetGalley and Harlequin Reviewer: DelAnne Rating: 4.75 Stars PERSON OF INTEREST When rookie K-9 officer Shane West and his German shepherd partner find the lead police dog trainer murdered, he's determined to bring the killer to justice. But then he discovers Gina Perry hiding nearby—a pretty junior trainer who had the motive, means and opportunity to kill her boss. Gina insists her troubled brother is the real murderer…and this isn't the first time he's killed. And when Gina's brother comes after her, Shane is assigned to protect her and uncover the truth. Suddenly, Shane—a cop who always hoped to join a big-city force—vows to stay by Gina's side as a murderer lurks in the small-town shadows. Rookie K-9 Unit: These lawmen solve the toughest cases with the help of their brave canine partners. Those wonderful brave dogs and their courageous handlers are back in an all new series. New adventures with new lead characters that are strong, independent personalities to inspire the readers with their desires t protect those in need around them. A well developed plot and vivid writing will bring the story to life and draw you in to the point you will feel you are there experiencing it with the characters. My rating of "Protect and Serve Rookie K-9 Unit Book 1" is 4.75 out of 5 stars.